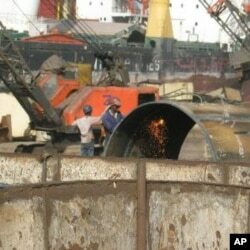 Shipbreaking yard at Alang beach, Gujarat province, India, 2009. Alang beach in India's Gujarat province is one of the world's biggest shipping graveyards, an access-restricted, mafia-controlled funerary ground for hulking steel-container vessels marooned for demolition. Eighty percent of the world's international trade crosses the globe by ship, and each year hundreds of these massive retired freighters are physically dismantled in ocean-shoreline breaking yards. Two reports released in New Delhi this week are renewing focus on the industry's near total lack of environmental or labor oversight, and its connection to organized crime. According Federico Demaria, an Italian economist affiliated with New Delhi's Jawaharlal Nehru University, even gaining permission to watch shipbreaking in progress can prove extremely difficult. "Access to Alang is not permitted for foreigners, for journalists, for researchers, for anyone who can actually find out what is going on on the ground," he says, explaining that he got a glimpse of Alang in 2009, only after posing as a scrap trader. "You are supposed to ask permission, [and] I have been waiting for it for three years now, and I've [still] not got it." What he did get, however, was first-hand exposure to an aspect of trade and international commerce that few ever hear about. At Alang, he says, defunct trans-oceanic vessels stand like decrepit, abandoned city skyscrapers that have washed ashore, awaiting the arrival of laborers who, armed with torches, enter the structures to manually deconstruct them. On any given day, he says, one might see a two- or three-ton slab of steel fall to the beach below, or sometimes onto workers. Critics: Gujarat shipbreakers lack rights, India, 2009. While advocates of Indian shipbreaking say the industry recycles cheap steel into the economy, fueling development and providing jobs, critics object, citing lack of health care, adequate housing or compensation for debilitating accidents that frequently befall its labor force. "How much do you count for a worker's life?" Demaria asks. "For example, I was not allowed to enter one ship in the Alang beach explicitly because the shipbreaker told me, 'If an accident happens, you'll be too expensive. I can't pay you.'" Yet compensation for Indian workers, he says, is cheap. "If they [compensate their own employees for work-related injuries], they would give something like $1,000 to $2,000, which is insignificant." Shipbreaking used to take place mainly in Europe, under more controlled conditions, but globalization has opened the market for unregulated operations like those in Alang, where shipping companies sell older vessels to intermediary companies that exist only on paper, who then sell the steel structures to shipbreakers. Gopal Krishna, an Indian environmental activist, says the industry is hazardous not only to laborers, but to the entire ecosystem and people whose livelihoods depend on it. "Most of the ships, which are 25-30 years old, are asbestos-laden. They are laden with persistent organic pollutants like PCBs, polychlorinated biphenyls; with waste oil; with ballast water," he says, none of which is managed in an environmentally sound manner. Prying eyes of industry observers, he adds, are shielded by local mafias driving the enterprise. "It is a source of black money in the country, one of the least acknowledged sources of black money," says Krishna. "There is collusion between the ruling party and the opposition party. Business interest, the profit motive alone, guides the political parties, which provide patronage to shipbreakers. There is no rule of law in Alang." Demaria and Krishna warn that the industry's lack of oversight could impact the West in the form of contaminated and radioactive imports wrought of improperly treated steel. New Delhi's failure to regulate and modernize shipbreaking, they say, will probably cause India's share of the industry to be subsumed by China's shipbreaking market within a decade.